Hang a sign or group of signs from the overhead and let them move. Mount a small sign to a wobbler and hang that on another sign, a cash register, or any other surface. Motion draws attention to your signs. Take advantage of that with these mobiles an wobblers. This 3-sided mobile kit includes two molded mobile center pieces, one c-hook with string and six pieces of double-sided foam tape. Affix three printed panels to the mobile center pieces (top and bottom) and join the edges of the panels with the foam tape. Attach the barbed-end string to the hanging point on the top center piece and connect the c-hook to a ceiling to complete the mobile. 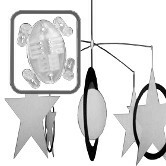 This mobile hanger is a simple and versatile central fastener for lightweight mobiles. The hanger provides a central hanging point, and has holes into which wires can be inserted to create a four-armed mobile. 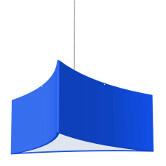 The hanger has twist-off tabs which mount on the end of the wires providing hanging points for the mobile panels. 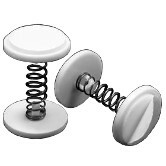 These deko springs attract attention to small signs with a bobbing and wiggling motion. Adhesive mounting bases are positioned on either side of a spring — attach one side to your sign and the other to any smooth surface.Mounts signs to displays, counters, cash registers, slot machines and many other surfaces. 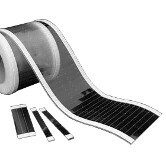 Our wobbler strips are a simple, low-cost and effective way to add motion to your small and medium-sized signs. 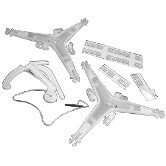 Attach one end of a wobbler to displays, counters, cash registers, etc. and the other side of the wobbler to a small sign. The flexible PVC material adds motion to the sign. 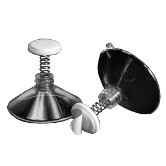 These suction cups feature a spring-mounted adhesive button inserted into a 1/4" hole in the stem. Removing the button’s peel-and-stick liner allows small signs to easily mount to the button. They are great for adding motion to a small sign.